Rather than fade away after leaving the sport, ex-rowers often hang-up their oars in favor of a bike and become avid cyclists, and seriously powerful ones at that. Rather than fade away after leaving the sport, ex-rowers often hang-up their skulls in favor of a bike and become avid cyclists, and seriously powerful ones at that. I have fitted and sold bikes to a number of accomplished rowers in the past, such as the Winklevoss twins, Jordan Sagalowsky and Harry Parker, the luminary coach of college rowing, during which time I observed a discernible path that led these giantsfrom water to land in thirst of another discipline that would provide them with the same watt-induced rush and physical exertion that came from rowing. However, unlike the average rider, selecting a bike and wheelset capable of providing a stable platform for theseclydesdales is absolutely paramount. And while carbon fiber has provided a new frontier for creating super lightweight frames and wheels for a majority of the cycling masses, those same attributes can prove to be deleterious for the largest riders like rowers. Indeed, over the years I’ve witnessed more bikes pretzeled and wheels taco’d under the auspices of large cyclists than I care to think about. In fact, at one point it almost seemed as though none of these companies were even taking into consideration that not everyone using their products was an aspiring human Wasa cracker. Jumping ahead to the present, a good friend and long-time fixture in the bicycle trade, Dave Powers, introduced me to a new brand of wheels called Princeton CarbonWorks. He extolled not only the extensive research and development behind them, but also their lineage to the sport of rowing and the philosophy surrounding them. By the way, Dave also happens to be an accomplished ex-collegiate rower himself, and his sheer size proves it. It’s no coincidence that Princeton CarbonWorks was founded four years ago by former US National and World Championship Rowing Team members Marty Crotty, Brad Werntz and Harrison Macris, later joined by Paul Daniels. Born out of their desire to create a wheel that could surpass the competition in terms of performance and reliability, while also being cost-effective – terms that can sometimes be antonyms of one another – they set out to change the way the cycling culture thought about wheels. According to Daniels, this quest involved more than just an attempt to out-source a wheel that checked all of the boxes, rather it involved a ground-up approach to design that embarked upon four years of extensive development involving everything from prototyping, to prolonged testing in the wind-tunnel, to the custom fabrication of proprietary parts (think hubs), while also perfecting the supply chain and manufacturing process. The culmination of these phases led to the recent launch of Princeton CarbonWorks’ first tubeless-ready full carbon clincher wheelset called the WAKE 6560, which features a bold execution of striking aesthetics and aerodynamic modeling not quite seen before. 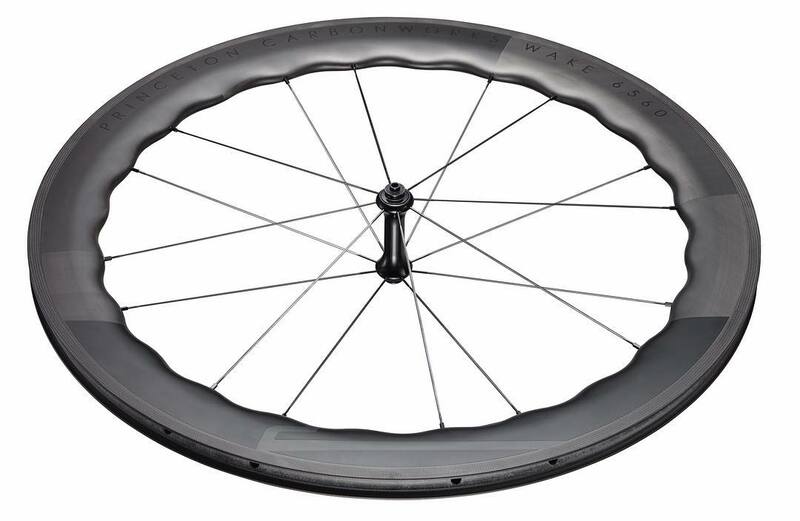 However, Daniels says the beauty of the WAKE 6560 is more than just skin-deep, as the wheelset not only surpassed the competition in virtually every category of testing including aerodynamic efficiency, stability, strength and speed, as one can glean from its unique rim profile, it also influenced the design of other wheels to come (think Zipp). 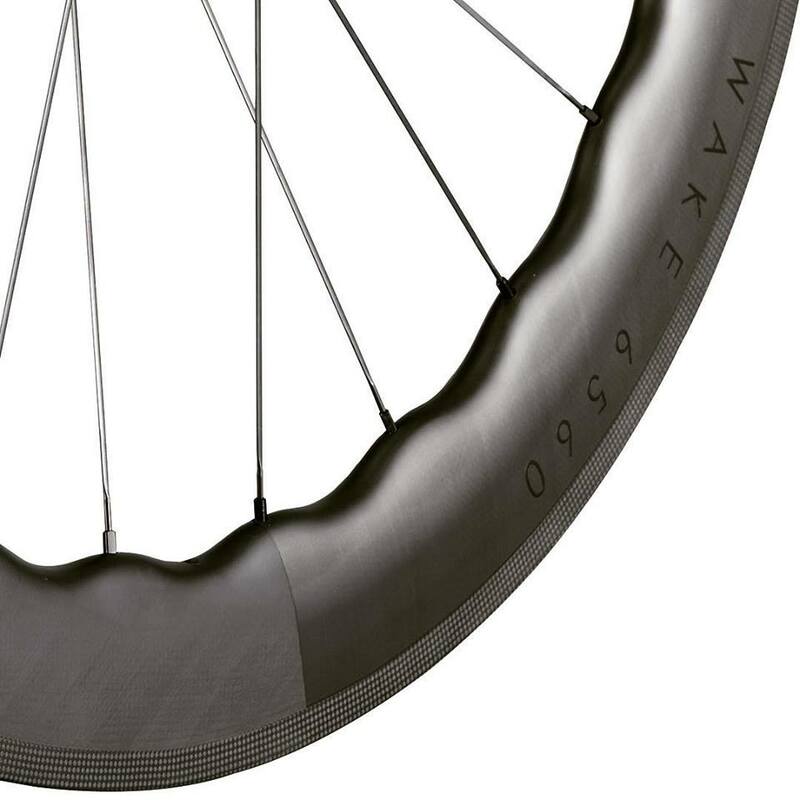 As its name implies, the WAKE 6560 features a rim profile that alternates between 65/60 millimeters, along with its own proprietary hub laced with Sapim CX-Ray spokes, that’s available in both rim and disc brake versions. Perhaps, the most intriguing aspect about the WAKE 6560 is the groundbreaking design of its rim, which features a series of 24 sinusoidal oscillations or waves molded into the structure of the carbon. 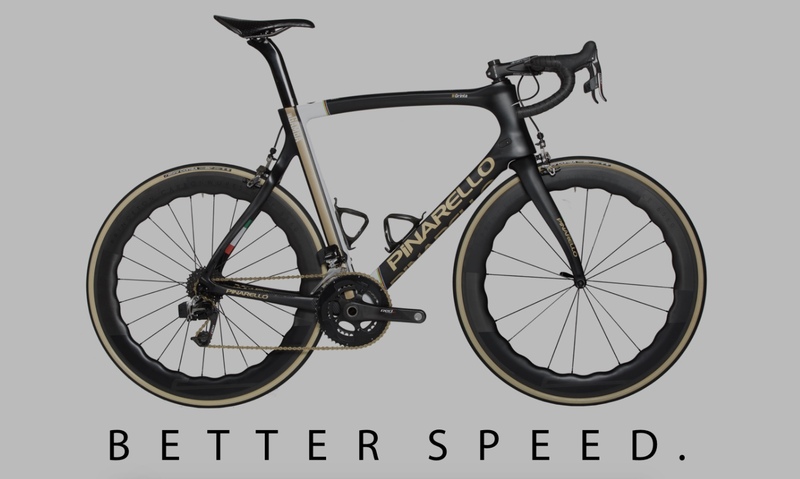 According to Daniels, this unique profile correlates directly into improved mechanics and aerodynamic properties, as well as a reduction in weight over the competition. To wit, “mechanically, the dynamic cross-section variability – WAKE – puts spoke tension point at a symmetrically convex section of carbon, vs concave (typical wheel), carbon is pulled in tension vs pushed into compression. Fiber is much stronger in tension (pulling vs pushing on a rope). Results in much higher degree of stress migration from the relatively weak spoke point to the relatively strong outer hoop than a standard wheel. Ie, stiffer, more responsive”, said Daniels. “Weight optimized through pairing advanced manufacturing with optimized mechanical design. The result is 1495g rim brake set for 62.5mm avg depth. 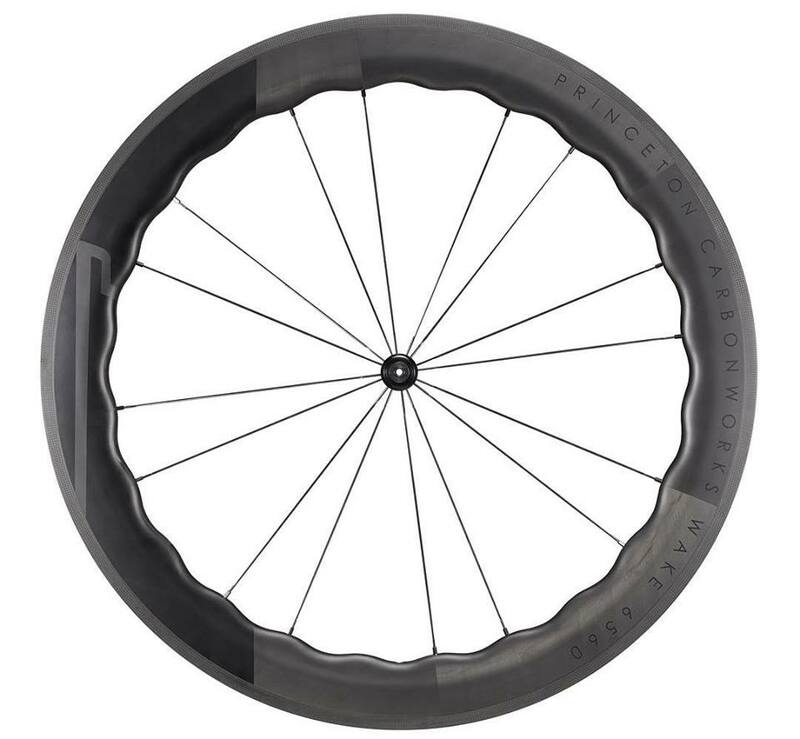 In a tubeless ready wheelset, not only lightest in 60mm category, but also lighter than nearly all competitors in the 35mm category”, Daniels added. On the topic of hubs, the WAKE 6560 features its own in-house design, which have been specifically drilled to the company’s specifications, while customers can also opt for more expensive Chris King hubs. However, Daniels says the company is currently exploring the prospects of developing their own premium hub upgrade. Additionally, during my with discussion with Daniels, he also spoke about a new low profile wheelset that Princeton CarbonWorks has in the pipeline called the 35/30, which carries over everything from its taller sibling but in a shallower 35/30 millimeter alternating rim that places no restriction on the weight of rider as well. The WAKE 6560 sells for $2,400 for the rim brake version and $2,600 for the disc brake, both of which can be upgraded with Chris King hubs for an additional $800. Following my discussion with Daniels, I wondered to myself, how much room is there left for another wheel brand in an industry that’s already saturated with too many? After hearing everything that went into the creation of the WAKE 6560, I reached the inescapable conclusion that there’s plenty of room for a boutique wheel as profoundly designed as this one. And, while I’ve chosen emphasis the fact thatPrinceton CarbonWorks was founded by a group of accomplished ex-rowers, the wheels are by no means aimed solely at larger riders, but serves as a testament to their strength and performance courtesy of The Land of Giants. Princeton CarbonWorks sells it wheels directly, or through arrangements with only the most exclusive shops. You can learn more about the WAKE 6560 by visiting their website here. In the meantime, we’re hoping to get our hands on a set in order to conduct a detailed review, but they’re selling out faster than one can yell coxswain!